Give your heart to the one you love, literally! 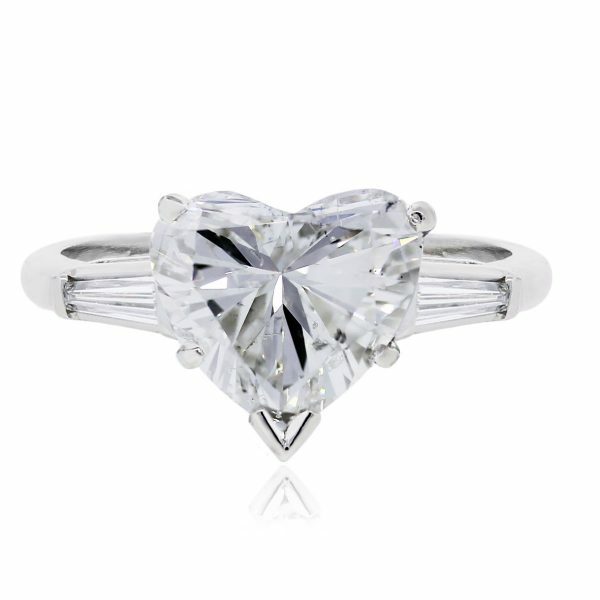 This stunning Platinum 2.96ct Heart Shape Diamond engagement ring is exactly what she needs resting on her finger! The fascinating Heart shape Diamond is approximately 2.96cts, G in color, SI1 in clarity. Accented with two beautiful baguette diamonds weighing approximately 0.30ctw, this ring expresses a big, bold, yet romantic look. Approximately 2.96ct Heart Shape Diamond. Heart Shape Diamond is G in color and SI1 in clarity. 2 accent Baguette diamonds approximately 0.30ctw are G in color and SI1 in clarity. Categories: Diamond Engagement Rings, Diamond Jewelry, Diamond Rings, Diamonds, Heart Shape Engagement Rings, Heart Shaped Jewelry, Jewelry, Platinum, Rings, with Diamonds. Tags: Diamond Engagement Ring, heart shape diamond, Platinum Diamond Engagement Ring, Platinum heart shape diamond engagement ring.